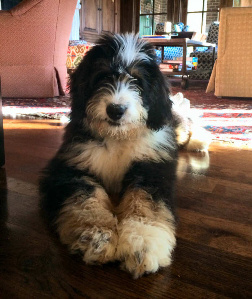 Blizzard is a stunning standard Bernedoodle from Coco and Colbert. He is owned by the Gitten’s family. Karley says: Blizzard is the most gentle, calm puppy you will ever meet. He adores all kids and has a very special bond with each and every child he comes in contact with. 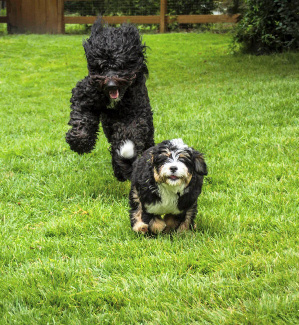 He is a bit on the lazy side but loves to play with other dogs, especially his sister Zolo, who is a mini goldendoodle from Swissridge. He doesn’t like for any of us to be out of site. He is the smartest in his obedience class and could probably even skip a level! My family has begged for a dog for years. Everyone was on board except me as I did not grow up with dogs and did not think our on-the-go family could take on such a responsibility. My children are now 14 (Gracie), 13 (Hannah), and 11 (TJ), and I started to realize I didn’t have a baby anymore to nurture. 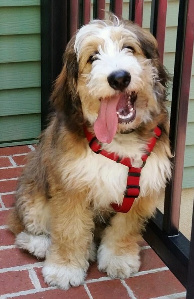 A friend emailed me a picture of a puppy a couple of years ago that I always held on to because I knew if the family ever won out on the puppy debate THAT would be the puppy I would want! 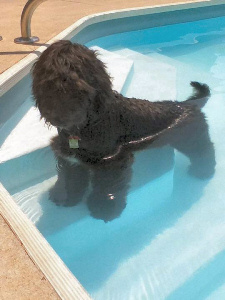 Turns out it was a Bernedoodle from Swissridge! 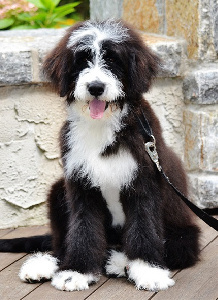 I finally caved in, and I emailed Sherry and inquired about this breed. 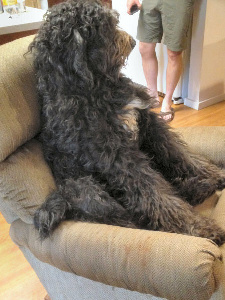 She suggested I read her book which is all about Bernedoodles. So I read it, twice! I did lots of research and asked lots of questions. 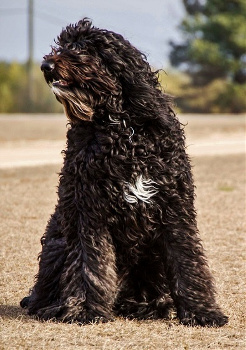 I became one of the many fanatical stalkers on the Swissridge Facebook page and that is where I learned just how beautiful, smart and awesome Sherry’s Bernedoodles really are. 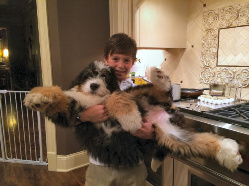 TJ, my son, was leading the campaign with the every day begging and nagging for a puppy! 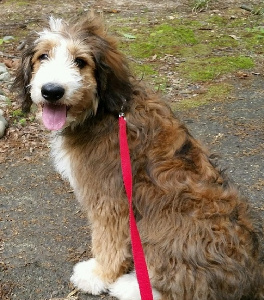 My husband, Tim, kept saying every boy that wants a dog should be able to grow up with a dog. 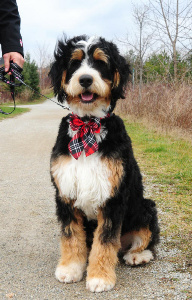 We decided to take the plunge and put a deposit down for a Bernedoodle. I knew by all the testimonies on the Facebook page that I could rest easy and know Sherry would find the perfect puppy for our family. At one point, Sherry posted a puppy who was born without an ear, and TJ wanted THAT puppy and no other! 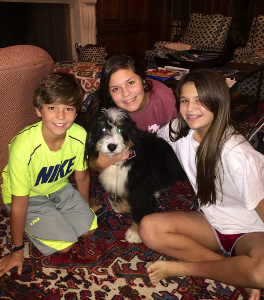 We were too late and another lucky family got that puppy and named him Lefty! TJ sent Sherry a video explaining how he really wanted that puppy and if anything fell through would she please consider him! It made my heart very happy that all three of my children wanted Lefty…though he was born with a slight imperfection, he was perfect in the eyes of my children. 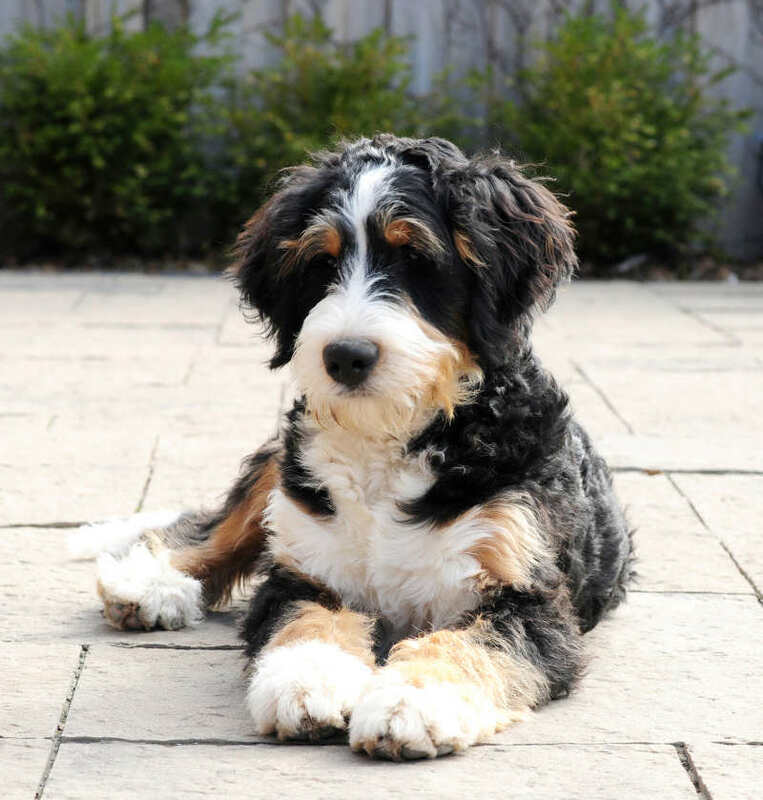 So we continued to wait and we let Sherry know though we wanted a mini, we would be happy with a large tiny or even a small standard Bernedoodle. The longer you wait, the more flexible you become because the waiting gets harder and harder. One day I was stalking the Swissridge Facebook page (as usual) when I saw a post from Sherry for a turn-key dog. She was simply the cutest puppy we’d ever seen! So Sherry and I discussed what a turn-key dog was, and with our busy schedules, it sounded like the perfect fit for our family. 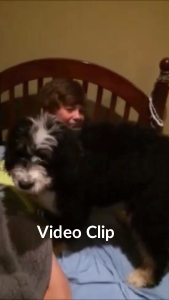 The only problem was TJ REALLY wanted a PUPPY! 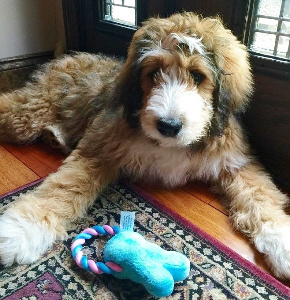 I called Sherry back and basically asked her if there was any way she could work with us on the time frame of getting this puppy and the amount of training she would have. Sherry worked with us and the rest is history! Dakota came to us crate trained and potty trained. Her temperament is beyond amazing. I’m pretty sure she thinks she’s a human. I’m beginning to think she is too! She has a wonderful personality, and she is so smart! We only had Dakota five days when I had to go to an event, and I made Gracie in charge of her for the evening. Gracie texted me to tell me that Dakota went to her potty door and before she could get off the couch to let her out, Dakota took the bells off the door and dropped them in her lap. I mean how smart is smart??? I can’t say enough about the whole process. From putting down your initial deposit to the waiting and waiting, I would go the Swissridge route every single time! I would also highly recommend the imprinting program or some sort of extra training through Swissridge because it makes the transition so simple and easy. Dakota has brought nothing but blessings to our family so far! Even my two teenage daughters that were always in their rooms are now hanging out downstairs, so they can be with Dakota. 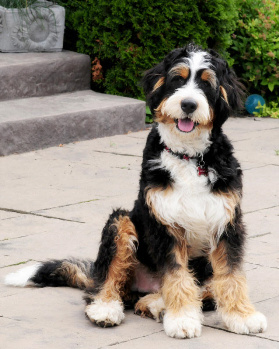 When we first decided on a Bernedoodle we were convinced that we wanted a puppy with the typical black/brown/white markings of a Berner. After we saw Maisy, however, we realized that we were so wrong! This fair-haired beauty won our hearts immediately. We absolutely love her wavy golden coat and white tuxedo accents. Once Sherry confirmed that her personality was a fit for us we couldn’t wait to get our hands on her. We decided we couldn’t handle all of the training ourselves though and thankfully we decided to enroll her in the Imprint Program first. Having her show up with this initial training completed made the transition so much easier. Even as a puppy she rarely nibbled on fingers, grabbed shoes or clothes to chew on and didn’t attempt to run away or tug when she was told to “drop it.” Her crate training was excellent; she went in the crate without an argument and slept through the night without a fuss on the very first night. Maisy settled in with our family right away. She greeted our daughters on day 1 as if they were old friends and she shares her love equally with all the family members. She’s an intelligent, sensitive and affectionate girl. Her sweetness has earned her the middle name ‘Sugar’ from our daughters and her bounding gallop spurred the nickname ‘Little Bear’ from Dad. Maisy is very curious about every living creature she comes in contact with but is never aggressive in any way. She always has a smile on her face and her tongue hanging out of her mouth. 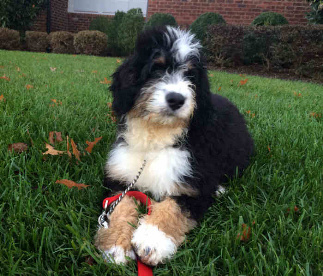 Willie, is a standard Bernedoodle, born March 25, 2013. His parents are Colbert and Channel. He is owned by the Spivak family. Melanie says: “It was a little more than a year after our beloved Golden Retriever passed away and I was ready to open my heart again. 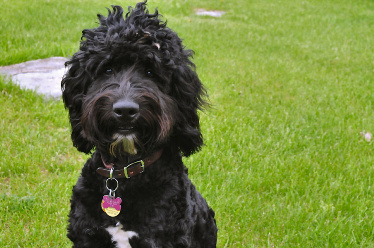 I was so impressed with Sherry, her website, the overwhelming support of all the families who have her dogs, not to mention how adorable all those SwissRidge dogs were, that I was hooked. After I sent in my application with as much detail as I could, Sherry responded and took the time to call me and talk to me further about the traits that I was looking for in a dog to make sure I got the dog I wished for. She suggested I join her SwissRidge family on Facebook to “meet” the other owners of her dogs. 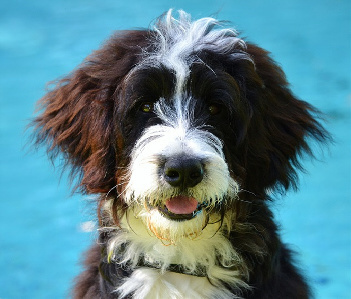 It was there that I discovered that Sherry had the incredible ability to create a perfect match for each of her dogs with their forever homes, so it was no accident, that Willie has turned out to be the perfect match for my family too. 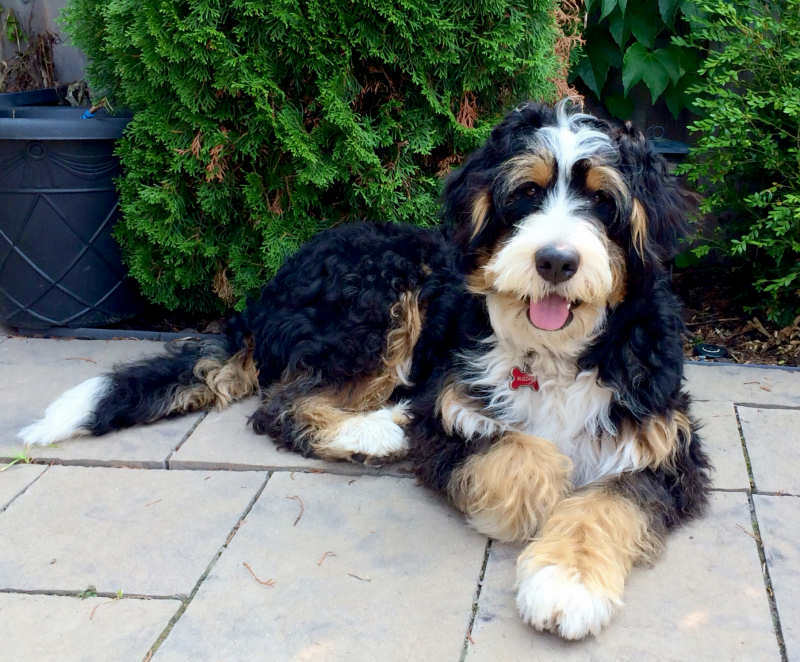 Puk is a Standard Bernedoodle. His parents are Chantelle and Daiko. Puk was born on Dec. 14th 2009. He is owned by Laurie Young. 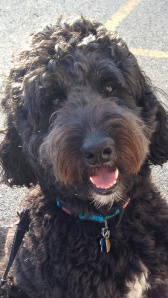 Laurie says: “Puk has been a wonderful addition to our family. He makes us laugh every day with his silly antics. He loves to sit on the sofa beside me and put his arm around my shoulder. He really is a big goofy dog. Puk is very affectionate, he wants to cuddle with you when ever you are relaxing. He is just an overall terrific addition to our family. 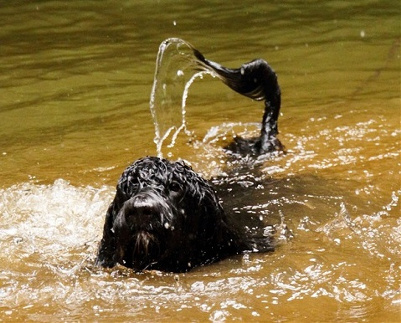 He is great to take hiking, swimming, jogging, anything that we like to do he loves to do. He just wants to be with us. He draws so much attention when he is out and about. I travel several times a year to visit family and Puk gets to come along with me at times. Last trip he took with me he almost gave a toll booth operator a heart attack. He was sitting up in the back seat as we were going through the toll isle, (He sits like a human in the car) as I pull up to pay the toll the poor lady working the booth shrieked and said “Oh Lord I thought that was a stuffed ape”, then proceeded to get other toll operators to look in my car at the Ape/Bear sitting in my car. He does weigh 80 pounds and is very tall and takes up all the space in the back seat. 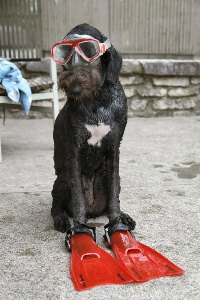 He just takes all the attention in stride. Sherry Rupke has been such a wonderful person to all of her SwissRidge family. I don’t know how she does it, but she always manages to match the perfect dog with the perfect family. I Fell in Love with Sherry’s breeding program when I saw all the testing that is done on every single breeding dog she has. 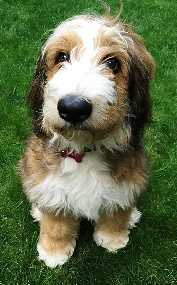 Then when you start looking at her website and all the beautiful pups, you are hooked. Meet Poppy. 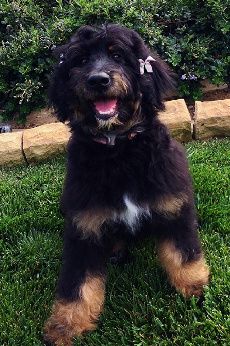 She is a standard bernedoodle out of Maui and Colbert’s litter. She is owned by the Faddoul family. Canda says: “Poppy is awesome. She is so sweet and playful. She goes everywhere with me and everyone loves her. She is always by my side at home and constantly gazes at me. When I first got her, my son threw a snow ball towards her and it hit her in the face. He was so surprised and even said, “She doesn’t look at anything but you!” She can sit, stay, shake, down, and comes running when I call her even if she is outside playing. She is not even 5 months old yet! Her disposition towards other dogs is engaging and teasing. We love her so much. I have raised many dogs but I am most impressed with her sense of loyalty. 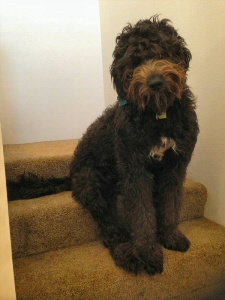 Sir “Banjo” VonBarklesworth Benoit McCloud-Wilhelmsen is a standard Bernedoodle from Libby and Dominique, Feb 12, 2012. In the 2.5 years that he has been with us he has brought so much love, light, and laughter into our lives. He is an 80 lb lap dog and cuddle bug, a friend to every animal or human he meets (but sometimes he can be a bit cautious at first), the life of the party, the class clown, and so smart that sometimes I wonder who has who trained around here. (He has recently trained me to bring him ice cubes with a low “woof” when he’s lying in the hammock.) He loses less hair than I do, so the shedding of his wavy coat is very minimal and hehas never bothered anyone’s allergies. 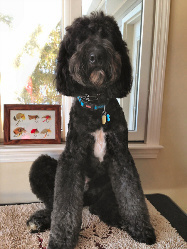 He is very laid back and always relaxed when we are, and ready to play or go on an adventure when we are…he’s the epitome of “man’s best friend”. One day when he was a (rather large) puppy we went to a nursing home to visit someone, and before we knew it we were stopping at EVERY room because everyone wanted to meet him. They just assumed that he was a trained and licensed therapy dog because he was so loving, gentle, and well mannered. He slowly crawled in bed and cuddled with the woman we were visiting even though he had never met her before. Since then, I’ve noticed that he seems to have a knack for picking out people who are in need of a little extra love.